After the art inspirations of last week, I wandered over to 가루서길 (Garusogil) to meet with some buddies for a few drinks and conversations. I've been tromping this street for a while now, and each time I fall a little bit more in love with it. I never thought it would happen, but this lady here is starting to like fashion! (Whaaa!!!) I've gone from skinny jean-cons-band tees to dresses and dare I say, heals. Garusogil is a strip lined with trees and loads of vintage, craft, and fashion-themed shops. But besides that, there are lots of cute restaurants, bars, and cafes. I've played in a bunch of the cafes but this time around I got introduced to Apartamento. 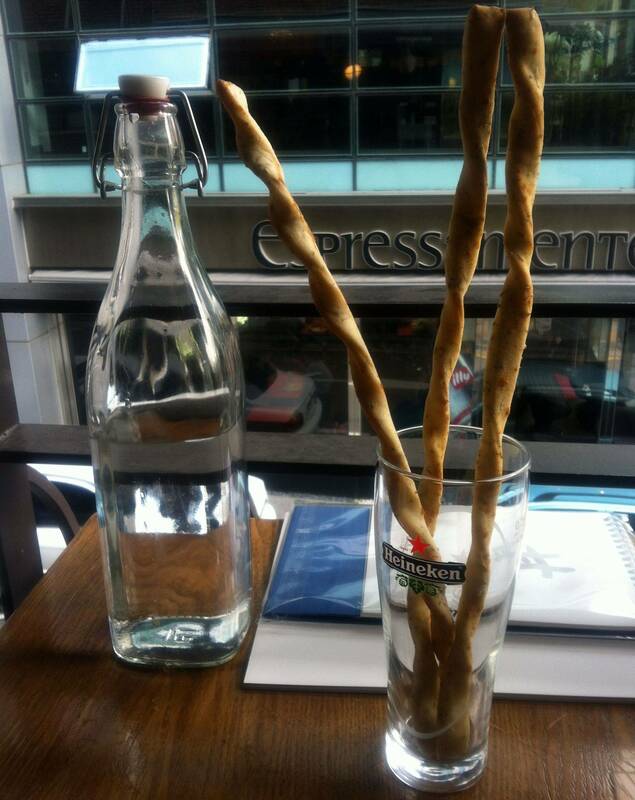 (CNNGO review) This cafe/bar is truly lovely, it is located on the second floor and a lot of the tables lie next to wide windows overlooking the street. Apartamento is better known for their pizzas and rustic Italian cuisine, but I have to say I can only speak for their wine and mimosas for now...and for that, go! The drinks aren't on the cheap side (10,000W for wine-14,000W for other cocktails) but with the ambiance and general pleasure of the place, I think it's worth it. My mimosa was bubbly and tangy, and truly delicious. 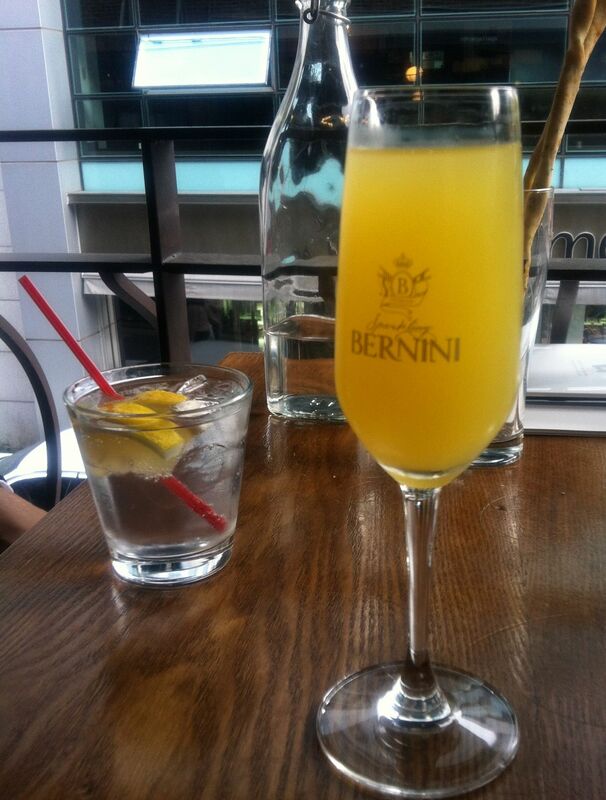 Last time I had a mimosa was when I was in the states, Christmas time 2010. It's been a hella while. My nana and I knocked back a bunch of these giggling like children while everyone drank alcohol-free cider and hot drinks. Ahh, nana, how we rage! One of the great added touches of Apartamento is the way they serve their water. It's in recycled tall glass bottles, very much like balsamic vinegar jars, or home winery bottles. They also give garlic bread twists (not vegan) but it was cute. I don't have any pictures of the wine, but for 10,000W a glass, it wasn't bad at all. The red house wine was dry and full bodied...I've been falling in love with wine again~ missing VT.
Anyways...Apartamento is worth checking out...I'll be back for sure! Directions: Sinsa station exit 8 (신사역 8번) walk straight and take the left onto Garusogil street. When you are next to the Tom'n'Toms, look across the street and diagonal from there in the 2nd floor you'll see Apartamento!